Four hotels in four nights; yes, it seems crazy and I certainly wouldn't do it again, but the choice to be so nomadic during our stay in Iceland was not just so I could sample four hotels. Factoring in that the three of us were arriving on one, but departing on three different flights, (meaning a total of four flight transfers) that we were chasing the Northern Lights, that we had to visit the Blue Lagoon as a priority, and that many of the other activities we were trying to fit in were either based in or exclusively picked up from Reykjavik, and also that our top choices (this and the Blue Lagoon hotel) were only available for one night at a time for 3 people and you'll see that this itinerary actually made sense (sort of). Having said that, this approach also led to a huge amount of time on coaches (after the first 2 hours of looking at frozen lava fields it gets a bit dull), and despite the heating being on full, waterproof walking shoes and two pairs of socks (one of them cashmere) very, very cold feet. Our room was both the largest and the cosiest of our stay (and the girls let me have the double bed in our room of one double and two singles), the bathroom had the best shower and this is also the kind of hotel where you can make a lovely cup of hot chocolate or tea in your room before wandering off to a lounge or the 360 viewpoint "lounge" to relax in harmony with nature. Another reason for choosing this hotel over the Blue Lagoon was the food. 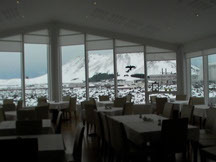 I’d heard some sad reviews of dinner at the Blue Lagoon hotel, so for a night when we were planning a relaxed dinner together this was the perfect choice, although the food was a bit patchy in places with some dishes arriving cooler than we'd liked. Starters and desserts were served buffet style which meant that I had a rather nasty surprise when what I thought was a chocolate mousse turned out to be some kind of brown raisin-y porridge – some of the local food just isn't to my taste! 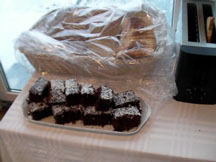 However the breakfast more than made up for it with not only last night's chocolate brownies and other cakes added to the breakfast buffet, but also masses of local smoked salmon, creamy butter and fresh bread. You really could eat your own body weight in salmon here. The smoked salmon still smelled smoky and was a world away from the average supermarket taste. 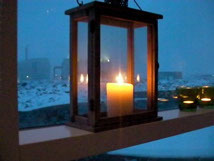 If you are comparing hotel prices in Iceland then you also need to factor in what is and isn't included. 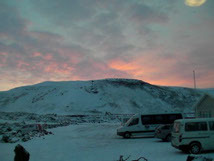 All of the hotels included good breakfasts and the usual hotel toiletries, the Blue Lagoon includes use of both the private and main lagoons, the Northern Light Inn includes transfers to the airport (as well as use of hotel towels for the Blue Lagoon – you can either walk or be dropped off by their complimentary minibus). If you're going on an organised trip most will pick you up from any hotel in Reykjavik, so if it's a full day you're best off staying in the city, and for a good quality hotel with nice views of the Harpa building (which changes colour!) and harbour I’d recommend the Centerhotel Arnarhvoll, good value, great breakfast and also a bath tub – although the shower did seem to soak the floor, but I'd skip their bar – horrendous service as it's also a restaurant and you only seem to get served when all restaurant guests have been seen to. There's also a mini spa in the basement, but you do need to give them notice to heat it up. All of the hotels we stayed at were wonderful in their own way but the Northern Light Inn comes out the top for me because of the views, and the feeling that, even sitting in a warm, cosy lounge you are out there in the ice, snow and smoke and northern light of Iceland.